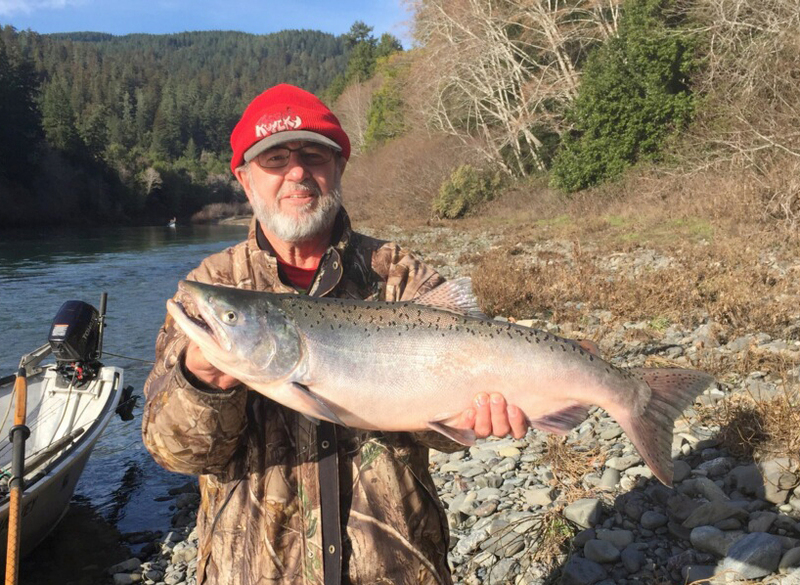 An angler proudly poses with a chrome-bright Chetco River steelhead caught last week while side-drifting. Chetco River flows have lowered to nearly 1,100 cfs, making the fishing ‘tough’ at best. 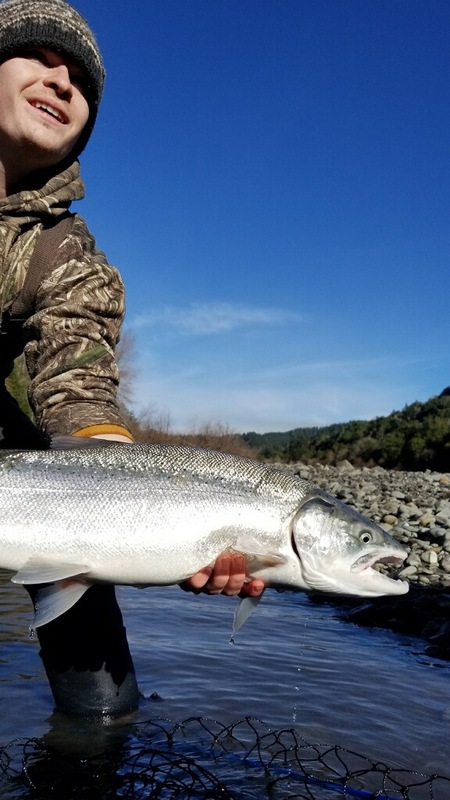 But according to Harvey Young, owner of Fishawk River Company, the numbers of steelhead have not been as high as they usually are in early January. Young has been averaging approximately one fish a day, so he feels pretty stoked about saying that his boat has been averaging one steelhead a day. That might explain why on New Year’s Day, one of his clients, Gary Chapman, hooked into a nice semi-bright Chinook. And that also might explain why on January 3, writer Rich Holland (who was fishing with Mark Gasich), caught another semi-bright king. 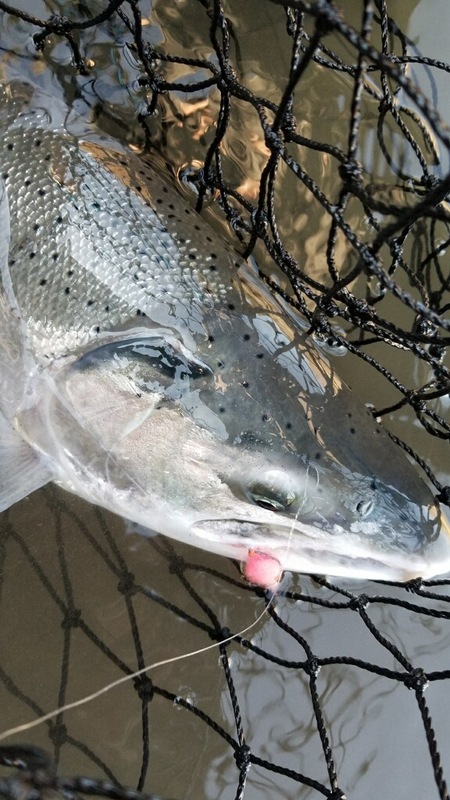 There are just not that many steelhead in the river at the present time, and with less competition in the water, the little known January run of Chinook are seeing the side-drifted roe and Puff Balls before a steelhead (either real or imagined) can grab it first. The luck might change for the better after an anticipated series of low-pressure fronts are expected to dump some precipitation in the area. And rain is usually followed by steelhead. The National Weather Service is predicting that the Chetco could rise to 22,000 cfs by Tuesday, but I would be ecstatic if the river just rose to half of that and dropped slowly. Either scenario would first usher in plunking tactics during high-water events, then followed by side-drifting techniques as the river lowers. 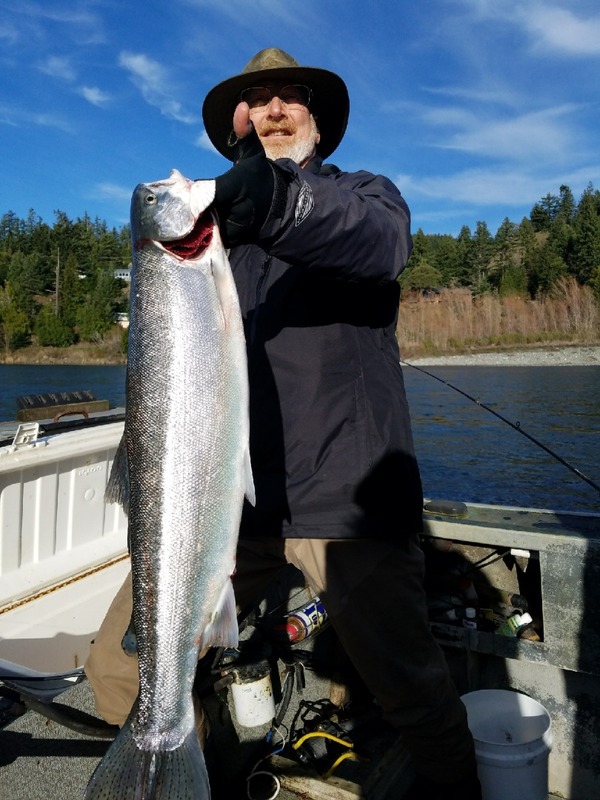 Even with lowering and clearing water, the steelhead fishing in the lower Rogue River from the Old Mill Sight downriver has been picking up for boat anglers who are setting out plugs. At the present time, the wild fish to hatchery ratio has been 4 to 1. The biggest fish in Anderson’s quiver was a nice 10-pound hatchery metalhead. There is no secret to fishing from a boat in this area. The first thing you will need is a good anchor, something that will not allow your boat to slip at all. The Rogue Outdoor Store in Gold Beach sells these types of anchors. 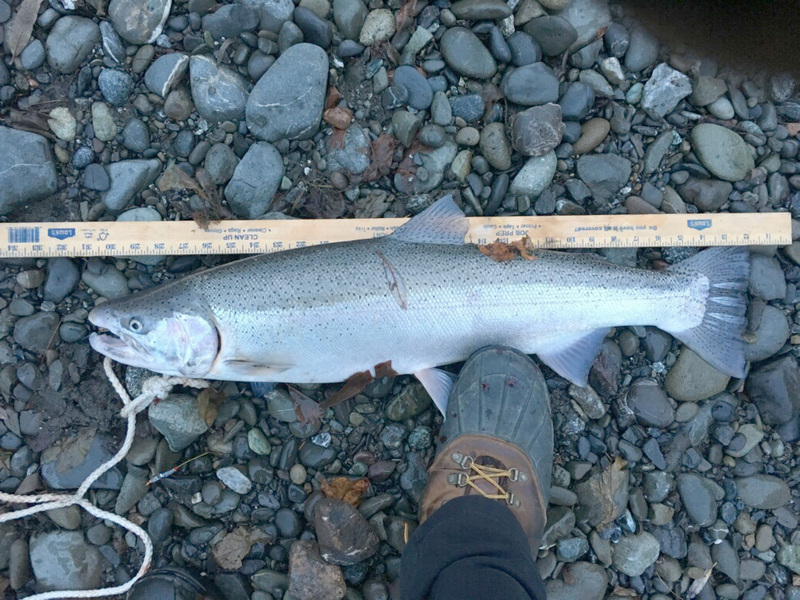 The second thing about fishing for steelhead is to find good-producing steelhead water. Productive water ranges from 3 to 5 feet, is on an inside turn and has current seams running down the middle. Throw in a few willows for good luck and you’re in business. A lot of folks will use their fish finders in combination with sticking an oar in the water to find this type of water. Once you have found the ideal 3- to 5-feet of water, motor your sled about 40 feet upriver from this spot and anchor up. Use a good plug rod such as a Lamiglas Hot Shot Rod. Set your plugs out between 35 and 40 feet, put your rods in their holders and then wait for the streamlined locomotives to hammer your plug on their way up the tracks. The strikes on these setups are nothing less than thrilling and explosive. Favorite plugs have always been the Brad’s Wigglers and Wee Wigglers in the colors Coppermine, gold with a red stripe down its back or a black stripe down its back. The theory behind using Wigglers and Wee Wigglers is that they both dive to 3 and 5 feet. But as it turns out, plugs that bottom out have also been quite successful. In the last several years, the 3.5-inch Mag Lip has been the go-to plug. These plugs will all bottom out in 3- to 5-feet of water, but that doesn’t seem to matter at all. The skip-beat action that these plugs exhibit just drives steelhead berserk! “Green Pirate and Show Stopper have been the hot colors,” notes Anderson. “The Show Stopper has really been hot – and it’s a brand new color. It caught 3 out of the 4 fish we got on New Year’s Day. Anderson is not afraid to switch out his plugs. If one color doesn’t get them to bite, he will try another color until it becomes the new, hot color. It just could be that the Show Stopper is a great clear-water color. Time will tell on that one. 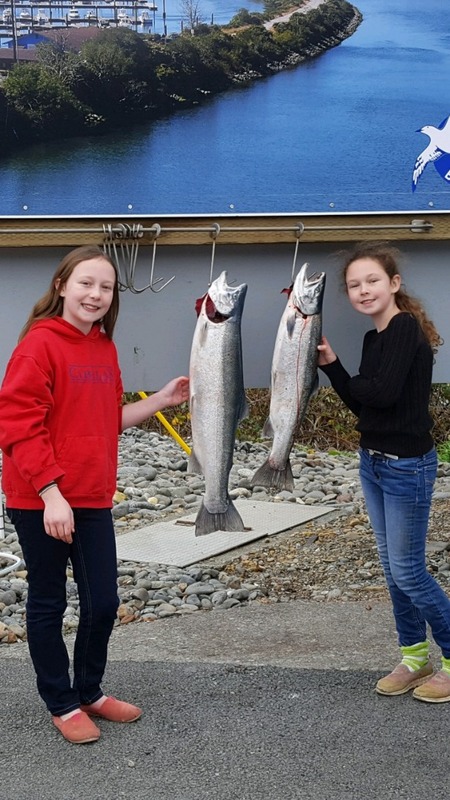 When the winds have died down and the swells have abated, anglers have been limiting out on lingcod and rockfish out of the Port of Brookings Harbor. But you have to choose your days wisely. For instance, this week is predicted to have gale-force winds and steep swells. But when the ocean lays down, you might only get one or two days like this a month in the wintertime. Just keep in mind that bottom fish and lings still have to eat. Specifically, the bottomfishing was great on Wednesday.